Looking for pergola ideas for your outdoor area? Pergolas give you an outdoor living space that will add beauty, give you a comfortable place to relax or entertain and increase the value of your property. Whatever your reason for building a pergola, you are sure to find the perfect design for your home. There are many beautiful pergola ideas to inspire you and help you build the perfect one for your outdoor space. Rooftop Garden Pergola: If you have a rooftop garden, you should consider building a pergola. You can create a beautiful outdoor dining area that allows you to spend time with loved ones on bright sunny days as well as starry nights. A sagacious idea is to paint the pergola white and build it right in the middle of a garden where you can grow permanent trees and shrubs, fresh seasonal flowers and of course, edibles like herbs, fruits, and veggies. Patio Pergola: You do not need expensive things to pull off a chic, high-end look in your outdoor space. You can create an amazing outdoor dining area in your patio under a pergola. You can transform your backyard by installing an iron pergola and plant some wisteria, which will turn into a breathtaking canopy overhead. This is a simple idea that will totally transform your patio into an elegant place to gather and dine with friends and family. Bermudan-Style Pergola: If you are looking for an exotic style for your outdoor space, why not go for a Bermudan-style pergola that has a hint of the Mediterranean? You can make an intimate lounge area underneath or create a relaxing dining area. Whether you are looking to do a lot of outdoor entertaining or lazing around under the sun, this is the perfect pergola to suit your needs and give you the look you want for your outdoor living space. Pool House Pergola: You can design your pergola based on structures that have inspired you during your travels. Create a beautiful pool house pergola by planting flowering vines all around the structure. They will transform the area beneath your pergola into a cozy room where you can enjoy your days and evenings. This intimate space is sure to become your favorite part of your home. Rustic Cedar Pergola: There is no rule that says a pergola needs to be smooth and perfect. You can create a pergola that gives your outdoor space, rustic elegance by crafting an arbor with cedar posts. Surround your structure with lots of green trees, bushes and shrubs as well as other plants. Add a fire pit for those chilly evenings, and you have the perfect place to gather with loved ones no matter what time of the year. If you are more into the rustic look, this is the perfect pergola idea for you. Lush Patio Pergola: If you are looking for a pergola for your patio that gives you a sense of enclosure, this is the perfect one for you. A fantastic idea is to install four 6×6 posts across the front of your patio arbor. It will help in giving the structure a substantial feel. Add two lattice panels which support a vine of your choice – Armand clematis vines are a regal choice – to give you that sense of enclosure you are looking for in this part of your home. Wrought Iron Pergola: Are you looking for a sturdy structure that looks great as well? Then a wrought iron pergola is the ideal choice for you. This will give your outdoor seating area structure. To make it even more beautiful, plant climbing roses so that they can grow overhead and give this part of your home even more charm. Add cane furniture underneath for the seating area and you have the perfect outdoor living room. Weather-Resistant Pergola: If what you want is a pergola for your patio that is perfect throughout the year, this is the best pergola idea. You can install a weather-resistant pergola which has a retractable canopy made of outdoor fabric to protect you from both sun and rain. Add comfortable seating around a fireplace, making that there are lots of plush cushions and pillows in quality fabric and beautiful patterns to add even more appeal. 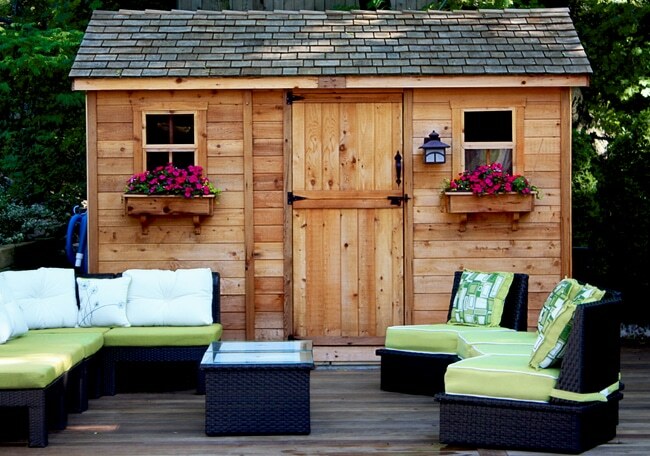 With this idea, you can create an outdoor living space that is fantastic for parties and entertaining all-year round. As you can see, there are many amazing pergola ideas that you can use as inspiration no matter what type of home you have. Pergolas really are prolific structures since they serve many purposes. They give you an outdoor living area that is perfect for enjoying a cup of coffee in the morning or entertaining guests on a beautiful night. So get inspired with these ideas and create the perfect pergola for your home.